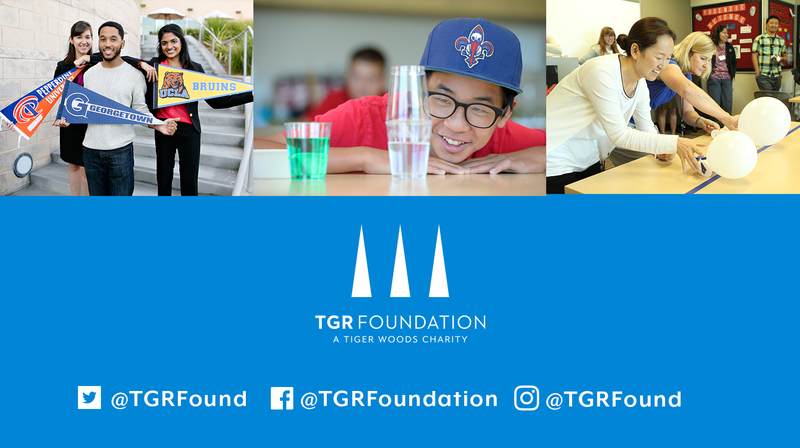 Fulfilling Tiger’s vision to reach more students throughout the nation, TGR EDU: Create is a program aimed at providing professional development and resources for educators involved with the vital subject of STEM education and college access. Join our network of passionate professionals committed to building a brighter future for students around the globe and receive our monthly newsletters. TGR EDU: Create has reached thousands of educators nationwide through unique professional development opportunities in STEM education and college access. Through innovative lesson designs and hands-on, project-based learning activities, educators explore strategies to enhance their curricula and prepare their students for future STEM careers as well as navigate them through the college application process. Our goal is for 270,000 students to benefit from enhanced teaching practices by 2020, after 5,000 educators receive strategies and resources for delivering quality STEM education and college-access programming in their classrooms. We offer a range of professional development opportunities — from a comprehensive one-week immersion to one-day workshops and seminars. TGR EDU: Create trains 200 high school counselors biennially. 94% of educators who participated in our professional development program, STEM Studio, reported increased confidence in delivering powerful STEM activities to students. TGR EDU: Create offers a FREE professional development opportunity for upper elementary school teachers in grades 4-6 with a variety of engaging STEM workshops at the TGR Learning Lab in Anaheim. Registration will be open after February 4, 2019. In-person professional development for educators in grades 4th - 6th. In-person professional development for educators teaching grades 6th - 10th. In-person professional development for upper elementary educators in grades 4th - 6th. In-person professional development for secondary educators in grades 6th - 10th. International STEM Studio is a unique opportunity for educators from around the world to learn how to make their classrooms active, student-centered environments, with a focus on Science, Technology, Engineering and Mathematics content. The 5-day STEM Studio will be held at TGR Foundation’s Learning Lab in Anaheim, California. If you are an educator in a school that is part of U. S. Department of State, Office of Oversea Schools, please download, complete and email the International STEM Studio application to Jason Porter – [email protected] – by March 1, 2019. Applications will be reviewed after this date and accepted educators will be notified by mid-March 2019. If you do not teach in a school that is part of the Office of Overseas Schools, contact Jason Porter for additional information. Through TGR EDU: Create’s weeklong training immersion, Adam Kelley and Melinda Steele used the Engineering Design Process to facilitate new project-based learning. Adam and Melinda effectively collaborated with teachers from many schools to incorporate new strategies and significantly improve their curriculum. Through their participation in TGR EDU: Create’s weeklong training immersion, two passionate educators, Adam Kelley and Melinda Steele, used the Engineering Design Process to facilitate new project-based learning. The elementary school STEM teachers effectively collaborated with teachers from various schools and disciplines to take their curriculum to a whole new level by incorporating strategies gained throughout the week. "The engineering process of TGR EDU: Create provides learning opportunities for both teachers and their students. Implementing the Ask, Plan, Create and Improve concepts in the classroom would significantly benefit any educator and drive his/her students to further excel." Click here for more information about our free professional development workshops.